Easy to carry, Easy to Set Up, Easy to Use! The Florida Magic PAS-787 is everything you want in a portable PA system and is the number one choice of performers, educators and speakers! For those of you that remember our earlier model, the PAS-767 (thousands sold worldwide and touted as the easiest to use, and best performing small portable PA on the market...), we took the concept of that unit and added improvements and more features to create the PAS-787. This new model was over 2 years in development. We are very proud of the result! The unit is small in size, measuring 10.5"x7.5"x5" and weighs just 5 pounds. It will fit under an airplane seat for you world travelers, or will easily stow in the corner of your prop case. We have been using these systems for years in all of our school assembly programs. Hundreds of kids have been packed into school cafeterias, auditoriums and gymnasiums to see our shows and this little PA system allows them all to hear the show. When working outdoors, expect the unit to cover about half the size of an indoor audience, as the sound disperses in the great open spaces - but you can still cover a couple hundred people. 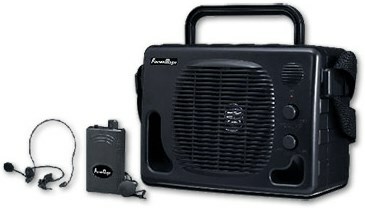 The unit comes with a wireless microphone system built right in. This is a high quality HIGH BAND system. That is to say it is NOT like the cheap wireless microphones that pick up interference from garage door openers, TV remotes and car alarms! You receive two microphones in the box, a headset mic, which you can wear on your head, or around your neck, AND a clip-on lapel mic. As there is only one transmitter (the little belt pack) you can only use one of the mics at a time. Simply choose the one that suits you best, and keep the other one as a spare. The auxiliary jack on the unit allows you to hook up a tape deck, CD player, iPod, another microphone, laptop computer, guitar, keyboard, etc. to your PA. The auxiliary jack has its own, separate volume control ( an important feature not found on most of the other small PA's on the market)so that the music can be set differently from your voice. The line out jack allows you to hook up the PA to a larger system, allowing you to use your wireless mic through the large system. More features: We've redesigned the transmitter beltpack for easier battery access and added a gain control knob so you can adjust the mic volume right from your beltpack! The headset microphone is redesigned to fit better and be more comfortable. The main unit has a built-in, fold down handle for easy carrying and a shoulder strap so you can sling the unit over your shoulder and carry your sound with you - great for tour guides, auctioneers, field trips, etc. The unit is now stand mountable (stand and mount sold separately). The really big news is that we found a way to install a built-in rechargeable 12V battery to power the system. The unit is now completely cordless and self contained! Just set it down, turn it on (no need to plug it in) and talk into it - couldn't be easier! The unit comes with an AC power cable so the unit may also be powered by plugging into a wall socket (also used to recharge the unit). The transmitter beltpack is powered by a single 9V battery. You may use an Alkaline OR rechargeable 9V battery (not included). If you choose to use a rechargeable 9V battery, we've included a 9V battery charger built into the back of the system along with a storage compartment for your transmitter/beltpack. You can recharge your 9V battery at the same time as the internal 12V battery - yes, we've thought of everything! Compare our system to those on the market costing twice as much (and more!). You will be happy you chose this one! Remember, don't fight to keep the audiences attention - command it! A good sound system is one of the most important, yet overlooked tools for any public speaker or performer. Don't delay any longer - give us a call and order one - you'll be glad you did! Built-In DC 1.2AH Rechargeable Battery for total wireless operation! DC 8.4V rechargeable battery charger! Easy to carry - Easy to set up - Easy to use! Lightweight, compact and rugged enclosure! High Band wireless lavaliere/headest MIC!